Waking in the tropics is heavenly! Walking out onto the cool sand, paddling in the warm water in the still of the morning...you can't beat it! Add a cup of coffee and this, for me, is paradise. But this was the big day; we board the boat and the rest of the crew arrives. The plan was to load up at the hotel, head to the boat and provision at the local stores. But Maria, our hotel driver had other plans! Fortunately, Paradise Resort has a golf cart to take us and all our baggage to the van so we avoided dragging our bags up the gravel path! Once in the van, Maria suggested we stop at the vegetable stand on our way to the boat, all on her time. This was one of the many kind and thoughtful instances we encountered on this trip. She took us right to the vege stand, where Betsy and Lu Ann, our designated cook, stocked up. The arrays of papaya and coconuts and yes, granadillas was a sight to behold! Packed into boxes, we headed for the marina to unload. We planned to take a taxi to the grocery store but once again, Maria said she would drop us there. So we piled back into the van and off we went. At the grocery store, she talked to the store owner, asking to have him deliver us and the groceries back to the boat. Although that didn't happen, for various reasons, mainly that there were too many of us and too many groceries to fit in the truck, we managed to cruise the grocery aisles, finding just about everything we needed. Remembering that we are in Belize and on Belizean time, we hung around the front of the store, sipping our Belikin beers, and waiting for the taxi the store owner grudgingly called for us. We heard later that the Asian store owners are not the most popular people in the community and their unwillingness to help was not unexpected. We did not let their attitude affect us! Back to Moorings base, all our gear had been transported to the boat. No schlepping for us! The boat, a Moorings 4800 catamaran, was amazing! And huge! Stepping on board was like stepping into a fair-sized condo, only better! With four big cabins, four heads and a small v-berth and head up forward, there was ample room for all of us. The aft undercover seating and table was where we all spent a lot of time, plus the forward seating and trampoline strung between the amas provided lots of seating and lounging areas. The steering station has all the necessary, latest nav devices, too. Designating who was to occupy which cabin involved who wakes early, who are the party animals, who snores, etc. These details all noted on a questionnaire Betsy had sent out early in the planning process. My roomie was Pam, my friend from Washington, but it ended up I slept out on deck, my favorite place! But I was always ready to pop back inside if it rained! Our remaining four crew, Pam, Claire, Laura and Katie showed up in the early evening. After getting everything stowed, we made our way across the road to the only restaurant within walking distance. The Laru Beya is a beautiful resort with a good restaurant where we celebrated our first night together. The next morning, bright and early and after a quick Betsy briefing, Diego our go-to person at the Moorings base, took us out of the slip and we were off on the Big Adventure, making our way down the very shallow channel and out to the deep water. Although the boat is big, Betsy is a pro and because the setup and navigation systems are very similar to the Moorings 4400 she recently sailed on, she soon got a handle on it. We did a bit of maneuvering out in the open water to get the feel of the boat and then it was off to our first anchorage - Ranguana Caye. 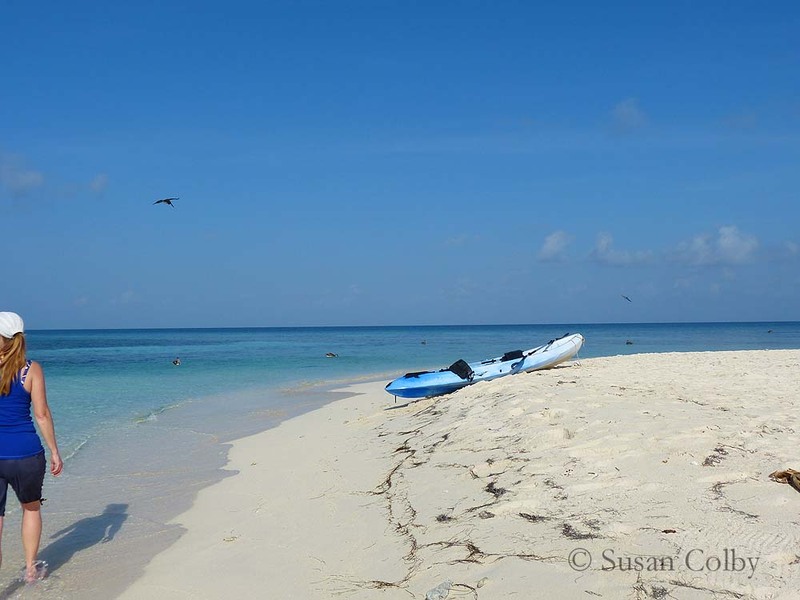 Ranguana is a tiny two-acre caye but it is the quintessential Caribbean island. Beach bar, sandy beach, palm trees and turquoise sea. Pulling into the anchorage, we had hoped to find a vacant mooring buoy but they were all taken so this became our first anchoring experience! Third time was a charm. 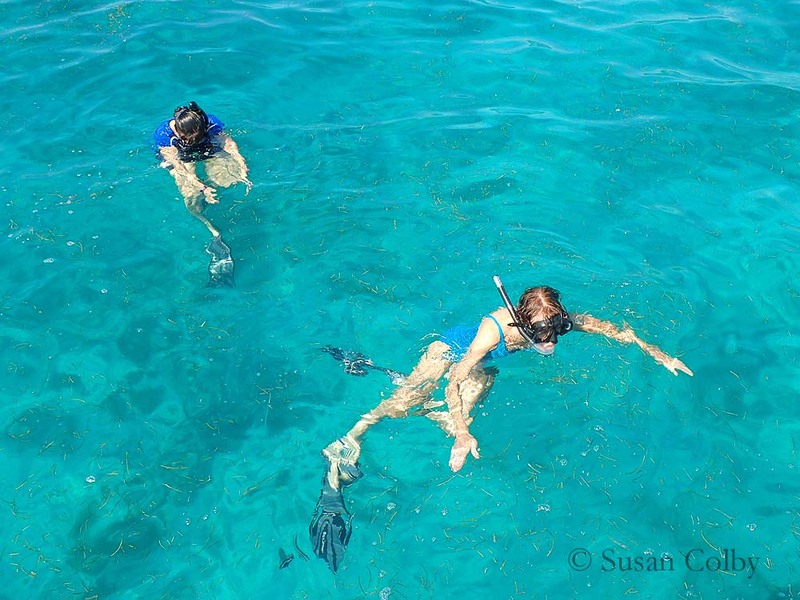 Our avid swimmers were overboard almost instantly, snorkeling over the anchor and Betsy got the thumbs up - anchor in sand and holding well. Shortly after that, we got a message that the French boat with the closest mooring was vacating it and letting us have it because "we were damaging the coral!" We later found that the reason he gave it up was that he didn't want to pay the nightly fee! What a wanker! The paddle boards and kayak were deployed and the crew dispersed. I went snorkeling with my new prescription goggles and camera which I discovered is going to take some getting used to! But nothing was going to stop the bliss I felt as I cruised the reef, enjoying every second of it. Being so fair skinned and white from living in the gray Washington climate, I was very careful to use lots of sunscreen and wear coverups as the sun in Belize is ferocious. By the end of the trip, I was very proud of myself for developing a light tan and no burns! That evening, we went ashore for dinner at Billy's on the Beach. What a pleasure to sit out on the benches, toes in the sand, enjoying a tropical rum drink and eating fresh snapper and grouper, caught fresh that day. It just felt like life couldn't get any better! Newer PostEndless Estrogen Goes Boom!